Author’s Note: Earlier this year I wrote a piece which was heavily cited and reblogged. I believe it addresses many points that anyone who is new to Bitcoin needs to be made aware of. I have updated the article with the latest happenings in the community and urge supporters to spread the news. I’ll start right at the beginning. Bitcoin was born out of the desires of a libertarian that wanted to see change in the global finance system. A change that was not governed, or centrally controlled. A change that could break down the walls of fiat reserve banking systems, and artificially controlled monetary systems. The concept was an idea. The creator, and inventor, Satoshi Nakamoto, turned the idea into a reality, by coding and implementing the solution for which he had just released a white-paper. The world now had its first true Peer to Peer electronic cash payment system, which allowed anyone to send a sum of value across the world, for literally zero fees. Fast forward almost a decade, and the Bitcoin we have today is stifled, congested, and unworkable for transactions that are too small in value. This is a result of the much discussed 1MB artificial blocksize limit. When creator and inventor Satoshi handed over control of the source code repository and network alert key to Gavin Andresen, little did he know that this action would result in a snowball effect of a takeover bid by the corporate elites. In the beginning, let it be stated that Bitcoin did not need an ounce of funding, and it came into fruition without any source of investment whatsoever. And suddenly it became a multibillion dollar market cap currency in a matter of a few years. And where there is money, there are companies out to get it. Ironically, right after the 2013 bubble Blockstream was born – in 2014, in fact. Founded in 2014, Bitcoin Core is funded by Blockstream, a technology company led by Adam Back and Gregory Maxwell. The stance of the leadership of this company is that the blocksize must not increase under any condition. Nor is the topic of blocksize increase even open for discussion. It is the ultimate irony that Bitcoin itself would become the subject of a centralized, censored, governed approach. When transactions cost an average $5 USD, one can’t help but scratch their heads and think, where did we go wrong? Why would the ‘leadership’ let things get this bad? What’s the motive here? Elitist attitudes know no boundaries in the interest of self-preservation. Bitcoin is a threat. But every threat is also an opportunity to exploit. The development team has been hijacked, and the original developers (such as Gavin Andresen and Mike Hearn) have over time been weeded out to make way for a team of developers, bloggers, and social manipulators who have blinkers on, and are of one thought. The blocksize must not increase. Let it be made known, that the Core developers refused any action on the Blocksize, well before Segwit was even on the horizon. It is no secret that AXA Strategic Ventures of the Bilderberg Group has significantly helped fund millions of dollars into Blockstream. Blockstream’s $76m funding over two investment rounds were on the basis that it produces a host of off-chain solutions, some working on private chains, some on public, and some centralized solutions. By funding Bitcoin’s development on this level, it forces Bitcoin’s future down a centralized path, that is; activating Segwit for second layer solutions, one that Blockstream would have more control over, and one which would be more closely aligned to elitist interests. The problem with having a development team funded to achieve one purpose is that there is literally zero room to move. There can be no negotiation, no debate, and no compromise. Because any compromise could potentially mean the purpose of funding is not satisfied. If Blockstream are not able to get their funding purpose into fruition (activating Segwit), then their organisation no longer serves the purpose of the elites, and will no longer be funded. 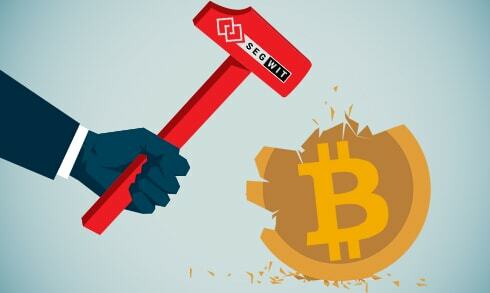 Segwit has made an impassioned return however, in the form of what many are calling a “compromise”. I place it in quotes because it’s a filthy compromise. I’m not going to mince words. Segwit2x is the latest ‘agreement’ to come out of the woodwork, this one has been led not by Blockstream/Core, but rather by Barry Silbert of DCG (Digital Currency Group). Again, DCG came into existence by receiving funding from MasterCard. Fundamentally, Bitcoin is a competitor to MasterCard. Read that again, and then think about it again. Bitcoin in its original purpose was a peer-to-peer payment system. It provides you with the ability to transmit value over the internet, almost instantly, at hardly any cost, without any third party involvement. This is absolutely a threat to MasterCard, and to VISA, paypal, Western Union, and the rest of them. Why would MasterCard want to fund this? Beacuse by restricting Bitcoin to a settlement system, it is no longer in competition with any of these. So now you are getting the picture. But why Segwit? Segwit does open a vector that provides the key holders with the ability to create endless side-chains; an inflationary model akin to the current finance system. But Segwit also helps MasterCard and VISA resurrect and achieve their failed SET Project – a secure electronic transaction system. SET also used cryptographic algorithms which would have allowed merchants to substitute a certificate in place of a user’s credit card number. The credit card number would never have to be made known. This bares striking similarity to the Bitcoin network given the public and private keys. Anyone heavily involved within Bitcoin circles is more than familiar with how ugly this fight is getting for Bitcoin’s future and scalability. The most rational, logical, error proof method is to follow Satoshi’s advice on simply increasing the blocksize cap. It’s not rocket science. More throughput leads to more transactions, which leads to more utility, and price. But various forums will delete or cloak your posts if they don’t meet Blockstream’s agenda, and at times outright ban. This strategy is often used to exert control over a populace. This is perhaps the single most powerful ploy used by Blockstream and Core. If debate and discussion on this matter were open and transparent, Segwit would have been dead long ago, and the blocksize would have been sitting at 8MB today. In 2015, Mike Hearn, an early developer who created a competing ‘Bitcoin XT’ client (which increased the blocksize), was one of the first to experience the full force of this censorship. Sadly, today, on the censorship front, not much has changed – in fact it’s worse. The real problems the Bitcoin network faces right now are the growing fees, and the delayed payments due to the network congestion. Blockstream supporters will argue that you need to upgrade your wallet, and pay the appropriate fee to have your transaction processed. This is a classic distraction method which does not address the problem whatsoever. It instead places the user in an awkward position, believing they have done something wrong. Make no mistake, the 1MB limit problem is artificially created. Satoshi may have placed it to begin with, but Satoshi also clearly stated that this limit should be increased as adoption of Bitcoin grows. By holding it back at 1MB, it ‘forces’ the problem, which in turn is used to push the “Segwit” agenda. The quality of the network will continue to suffer. The fees are rising, confirmations taking too long. Momentary clearings of the mempool are nothing to boast about. When heavy demand returns, it will be much worse and we will far exceed western union transfer fees. This strategy is adopted by governments and revolutionists when looking to create a change in any socio-economic system. “Painful but necessary”. We hear this mantra from Blockstream supporters all the time. “Rising fees are a byproduct” of Bitcoin’s success. Or perhaps to hear that these are the “teething issues of a growing network”. In truth, the simple solution is right there in front of our eyes, and simply requires a tweak to two lines of code. Core developers hold that they know what is best for Bitcoin because, well, after all they have some strong developers. But in the real world, rarely do developers ever dictate what the users want, should have, or need. In any business or software eco-system it is of course the users which drive special features, enhancements or otherwise. Developers may know how to code, but they are not economists, nor are they business owners that rely on Bitcoin for payments. In Blockstream’s opinion, anyone who supports Bitcoin Unlimited, or is pro blocksize increase, is stifling scalability, and is therefore accused of blocking Segwit. To the contrary, Segwit will offer a very mild blocksize increase, and will require a long time before it is not only activated, but also before its capacity increase can at all be realised. By then it would be beyond far too little and too late. Bitcoin Unlimited can resolve the situation now pending adoption. I can personally attest to being attacked as a Satoshi worshipping idiot simply for backing Satoshi’s white paper. “Satoshi isn’t God”, I was told. On countless times actually. When in truth, the libertarian view is the furthest point of any deity or governance over Bitcoin. By fighting Blockstream, Core, and Segwit we are fighting centralized governance. They’ll scream that “supporting a non-Core client” will create an Alt-Coin. This again assumes the general public understand nothing about Bitcoin, and comes from Blockstream maintaining their intellectual superiority. Bitcoin was developed not to be governed by any entity. The market, and the people, should always dictate its direction, not Blockstream, and certainly not any centrally governed entity. If you were to look purely at the technical, Segwit is so radical to Bitcoin that technically it could be the very alt-coin in question. But let’s not stoop to that level. Blockstream’s behaviour comes ultimately from a place of entitlement. By threatening that Bitcoin ABC, or Bitcoin Classic, or Bitcoin Unlimited will create an altcoin comes from a place where Blockstream believe they are the true keeper of the keys for Bitcoin. This forces the belief that without Blockstream there is no Bitcoin. Now with the upcoming plethora of forks, a necessary evil is taking place. Blockstream’s devs are in a corner where their hand is forced. Luke-jr in particular is advocating for a BIP148 chain-split. In the face of Barry Silbert’s much backed Segwit2x proposal, this may be Core’s last roll of the dice. Big blockers are also getting their forks ready, and with nChain’s recent announcement of a 20% hash power pool which will actively block Segwit transactions, things are certain to heat up. Whatever the outcome here, it is important that truths are exposed in the face of heavy censorship. Because economics will see Satoshi’s vision of a P2P global currency realised. Segwit and the settlement layer cannot win out here, not unless the censorship has its way.